Now showing and distributed in Australia by Universal Pictures. Las Vegas has changed in the last half a decade, there is no doubt about that. Movies about Las Vegas have obviously changed with the times and your typical film set in Las Vegas will more than likely feature male characters in the age bracket of 21-35 years old. That is where Last Vegas breaks through the mould. It is a Las Vegas film that doesn't fall into the stereotypical pool, but is a stereotypical film about four middle aged men trying to find their youth again. Yet it loses it loses it's stereotypical status once these four enter Sin City. What results is a film which may be predictable, but is still enjoyable and often very funny. The combination of Michael Douglas, Morgan Freeman, Robert De Niro and Kevin Kline is an absolute winner by all accounts. When Billy (Michael Douglas) proposes to his girlfriend while giving a eulogy at a funeral, he rounds up his life long best friends, Archie (Morgan Freeman) and Sam (Kevin Kline) for a bachelor party in Vegas before he ties the knot with his much younger girlfriend there. Archie and Sam also invite along Paddy (Robert De Niro), who was also once best friends with Billy but had a major fall out with him over him missing out on Paddy's wife's funeral. When the four arrive in Las Vegas, they find it a very different town to the one they visited years before and the town will make all of them realise the things they need to admit to themselves. Last Vegas really gives you no surprises. The middle-aged light comedy genre is proving to be a very predictable genre these days with it's characters always having some kind of epiphany directly related to the stage of life which they are at. There is really nothing wrong with this as it is what a lot of people want to see and what the target audience can relate to. You just know what you are walking into and you know how it will end up. However, once you take this film we have seen before and make it into a Vegas film, it feels like a film we haven't seen before. The location of Vegas seen through the eyes of these men actually makes the city look fresh and therefore makes the film feel far more original than it would be otherwise. 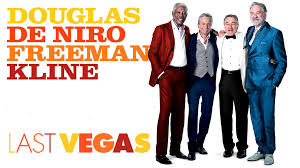 Even if though Last Vegas may not be the most innovative screenplay, it does absolutely carry some very funny highlights. The scene in the club where Freeman's Archie has his first Red Bull is very funny. The best thing about the screenplay is that it doesn't try too hard to be funny. It is true that it is predictable and simplistic, but it is this simplicity that works for the film. It does have it's tender moments, particularly when it comes to Paddy discussing his late wife, yet it is not overly emotional. It doesn't need to be as you feel an instant connection with each of the characters due to some marvellous character development. You have a bucket full of information about the characters backgrounds so you have an emotional connection with each of them. It's not an extremely in depth connection, but a connection nevertheless. Each of leading men are great fun in their roles. Michael Douglas does well, but it doesn't seem like a particularly complicated role for him and seems like it is just a matter of Michael Douglas playing Michael Douglas. Robert De Niro probably has the most challenging role as his Paddy is both cynical and standoffish at times, but he also earns the audience's sympathy without any trouble with his soft and tender side. Morgan Freeman and Kevin Kline are the two that provide most of the comedy relief through the film. Kline is especially funny as he plays the comfortably out of vogue man and his performance is just a lot of fun. 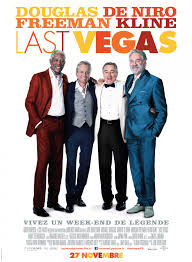 Last Vegas may not be the most original piece of work we will be seeing on our screens, but it is still creative in it's own way and a bit of fun.